Simply click on Discount tab. There are three types of discounts are there. 1. Common : If you wish to give any seasonal discount this would be the best suggestion. 2. Monthly Free: You can give one or more month flat discount based on the Invoice period. For example if you wish to give one month free for the annual customer alone that can be created under Monthly free discount. 3. Unit Based Discount: Unit based dicount is specifically applied for the certain units that you wish to have. It can be applied from all units page. By default this will be applied if the tenant picks that unit. 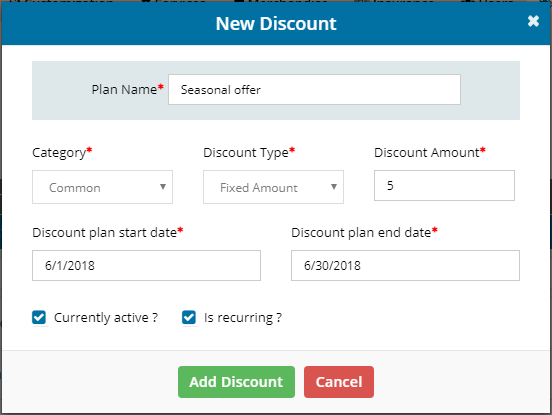 You can create Discount by clicking on “+Add Discount”, this will throws you a popup that allows you to create a Discount that you wish to add. Hit on "Add Discount" to save the changes made. 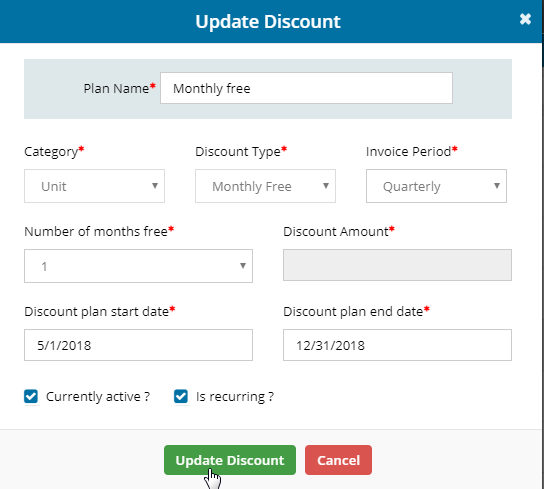 You also have the feature to Edit discount, hitting on the "Edit" option allows you to make changes to the existing discounts. Finally, Click on Update discount button.